If you aren't into eventing, the horse inspections are kind of a dress-up occasion. 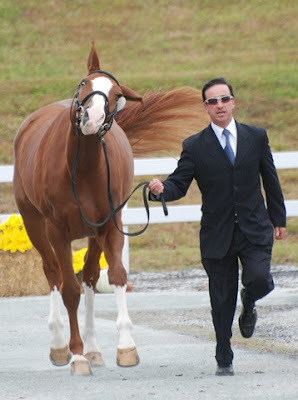 Here Ronald Zabala-Goetschel and Che Italica trot before the vets at the Fair Hill horse inspection -- photo from Eventing USA. Ronald is dressed to impress, but his horse looks like he had a hard night. A very cute photo. I've actually never attended an inspection in person, but here is the Wikipedia description: "Before the beginning of a three day event, and also before the last phase, horses are inspected by a vet to ensure that they are fit to compete further. 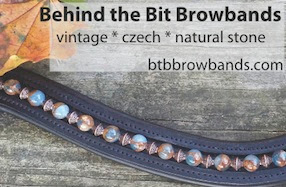 It is usually a very formal affair, with well-groomed and braided horses, and nicely dressed riders. It is also a very nerve-racking time, as the "pass" or "fail" determines whether the horse may continue with the competition." Do you have any other funny inspection/show pics? I'm always up for a good horsey laugh. Great pic! My sister did her first formal inspection (they also call them "trot-outs" for obvious reasons) last summer. She was so nervous! She spent at least a week agonizing over what to wear, LOL. Eventing magazine in the UK even has a fashion bit in it's diary pages looking at what the riders wore! With many a groom in the background who has spent the whole night hosing and massaging equine legs. Been there, done that. (Grooms don't look as spiffy). It's nice that some things remain formal. Though I wouldn't stress what to wear - a tasteful black dress and sensible shoes to trot in.